I’ve discovered that when I go for a walk, I’m not really all that aware of my surroundings – basically, a walk is an opportunity for me to think. So I tend to walk with my head down, looking at the ground in front of my feet, but otherwise miles away. Now, it turns out that not everyone takes that approach. Some people actually pay attention to their surroundings; some people – this was actually a surprise – think the purpose of going for a walk in the country is to look at nature and, in effect, inventory it. And so on (or something like that – I may have confused some of the technical names) for a goodly mile or more. Very strange. You see, nature to me is effectively one thing, indivisible, rather like a still photograph. It’s all just “nature” to me. Going for a walk in the company of people who actually understand it has the effect of bringing bits of it into close up, or putting it under the microscope: it’s amazing all the stuff that’s out there. But learning the names of plants and birds is a bit like learning Latin declensions, or the capitols of Europe – it feels like homework, somehow. So I think I’ll continue to let it wash over me, and get my expertise vicariously. 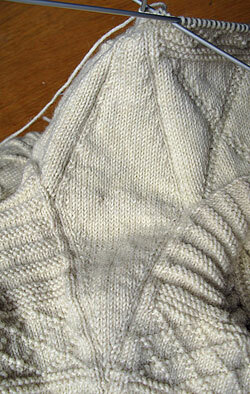 Meanwhile, I’ve slogged my way to the end of the gusset on Sleeve 2 – and it really felt a bit of a slog, too. But it’s speeding up, and the end is now in sight. For those gusset-watchers among you, note that I’ve decreased on the left-hand 2 edge stitches of the gusset, but on the right edge I’ve decreased on the 2nd and 3rd stitches in from the right, leaving the very edge untouched. 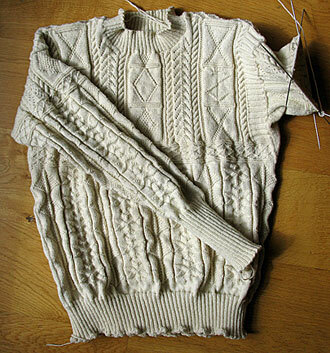 The purpose of this is to ensure an unbroken edge stitch – if you decrease on the 2 edge stitches on the right, the one on the very edge is always being engulfed by the one to the left of it, like a kitten being swallowed by a python. It just makes a neater effect, that’s all. I avoid the whole issue by not going for a walk. things, let alone knew what they were.